How To Dominate Your Opponents With Stunning Quickness, Explosive Power, and Jaw Dropping Agility... Even If You Know NOTHING About Athletic Development Right Now! Starting today, your baseball players can make dramatic improvements in their athletic ability (and reduce the risk of injury)... faster, safer and easier than ever before! The drills and techniques you're about to discover are 100% CUTTING EDGE -- developed, tested, and refined in the training centers of top MLB, NFL, NBA and US Olympic teams. All explained and demonstrated by Scott Phelps, an athletic development "guru" with more than 28 years of elite-level experience. 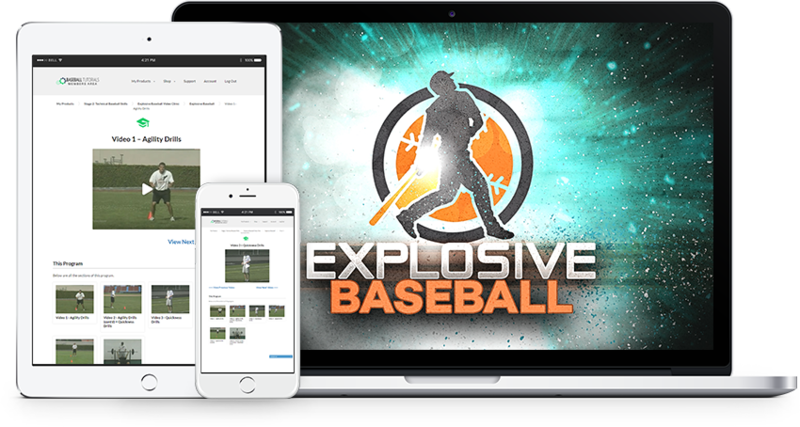 It's called "Explosive Baseball" - and it breaks down all the essential skills and drills you'll need to develop a supremely athletic squad, and start dominating your opponents in every phase of the game. With this online video training system you'll discover how to dramatically improve your players' strength, speed, quickness, agility, and power... and gain an immediate advantage on the competition! The system is broken down into five modules. Each section focusing on a specific area of athletic development. Almost two hours of instruction in all. No complicated theory. No biomechanical mumbo jumbo. All you get is simple, straightforward drills and workout routines you can take straight to the field. We'll even show you exactly how many sets and reps to do of each exercise. Jam-packed with proven drills to develop an explosive first step and jaw-dropping acceleration. Get quicker reaction on the ball, cover more ground, and boost your fielding effectiveness! Build pro-level power in the upper body, lower body and core, and learn how to apply it to baseball-specific movements. Your hitters will see massive increases in bat speed and power... and your pitchers will be throwing up to 6mph faster! Discover how to improve your athlete's running form, how to build stabilizer muscles to prevent common knee and ankle injuries, how to install more fast-twitch muscle fibers into the upper and lower body... and a lot more! Just contact us and you'll receive a prompt refund of every penny of your purchase price - no questions asked and no hassles. Click the Add to Cart button below to get started now!